Yesterday, in day 3 of the Symposium, Amanda Golden kicked off the afternoon with a rivetingly brilliant paper on Plath's "Purdah", Sanskrit and so much more. The paper examined Plath's experience in working for the Sanskrit department at Harvard University, briefly, in her 1958-1959 year in Boston. Plath had some education with the language through her reading of T.S. Eliot's poem "The Waste Land" and from courses taken at Smith particularly under the tutelage of Professor Drew. Amanda's work in the archive is inspiring and thorough, as was evidence in both the slides she presented of Plath's annotations in her books, but also in the notes she took in her courses, which indicate the process by which Plath studied. Amanda spoke at length about Forster's novel A Passage to India, which she also read in the Boston year, and how reading it thus informed her short story "The Daughters of Blossom Street" and later her poem "Purdah" (a scan of the word 'purdah' underlined in her famous Dictionary - held at Smith College - was particularly resonant. Golden contended that in some ways her reading of this novel lead her to be less interested (for lack of a better word on my part) in virginia Woolf because her rendering of life was less believable/real than in Forster. Amanda is a rare, bright star. Following on Amanda's heels was David Trinidad whose essay on the biographicl references and sources to Plath's October poems was an inspired piece. For those that were there, I think we can all agree that we could have listened to David speak for about 17 more hours. Or more. Culled down from a large piece, David focused on the poems written after Hughes left Court Green including "Daddy" and "Eavesdropper" and "Lesbos", among others. An extremely careful and detailed work of art, David's essay was, quite well received, a highlight included a calendar layout of the month with the names of the poems written in on the days in which they were composed, and other significant events, as well as contextual photographs that are important to the poems including the photograph of Otto Plath standing at a blackboard, and photographs take by Gail Crowther of the home the Kane's in St. Ives (where Plath stayed the weekend of Ocober the 13th/14th), which features in "Lesbos". I look more and more forward to anything David sets his mind to do. Equally, Tracy Brain is another Sylvia Plath scholar who continually fasincates and impresses me. Her presentation on "Medicing in Sylvia Plath's October Poems" was very well done and stayed within the limitations of the conference, much to the disappointment of everything in the audience who, as with David and Amanda, wanted more, more, more. Jumping off from a photograph of a nearly eight year old Plath dressed as a nurse in Winthrop during her father's final illness, Tracy traced Plath's experience with the medical world and her interaction with it in texts. Citing excised text from The Bell Jar, Plath's famous Orr interview, and poems and prose, Tracy concentrated on the bee poems, "Lesbos", "A Secret", "The Applicant", "The Jailor", "Fever 103", "Lesbos", and "Lady Lazarus". The third day of the Symposium was truly a memorable one. It was so packed with panels and conversation, it was like sprinting a marathon. I've had a chance to meet a of people with whom I've only emailed. It it is wonderful to put faces and voices with the names. But there wasn't even enough time to talk to everyone as much as I really wanted. Fighting through a gaggle of other visitors, the only Sylvia Plath scholar deserving to be at the gravesite today sent these photos in for us. While there, Gail planted a Blue Moon rose bush. This morning's panels and presentations by Maeve O'Brien, Christine Walde, and Karen Kukil was better than coffee. Below are rough notes taken during the talks and are relatively raw. But it is more important to get this out than worry about finesse, perhaps. Maeve O'Brien's presentation: "'Something in me said, now, you must see this': reconciling death and 'the empty beaches of memory' in 'Berck-Page'", brought much attention to "Berck-Plage", what she terms a "notoriously difficult" poem. Reframe poem to focus on new themes in the poem. So many of the things at Berck are still there, which gives a tangible grasp of what Plath saw and experienced. O'Brien cited the work of Gail Crowther ("The Playfulness of Time") as well as Anita Helle and others. Silence - what Plath mentions, but also what is absent from her poetry. What is not revealed in the beach scene in Plath's "Berck-Plage"? Friction between what she expresses and leaves silent. Plath negotiates language on two different levels. War and holocaust imagery more bold after "Berck-Plage", though she touched on this topic in her earlier poems, such as "The Thin People". First three parts, Plath does not directly mention the war, which by its absence from the poem makes itself apparent. "Why is it so quiet, what are they hiding?" the scene is grotesque and unnatural. Surroundings described in an abstract way. She can feel the hurt and the memories of the pain around her, but does not know why. Distant from memory, history and compassion. Speaker articulates the futility to reconcile the past. It is at this point where Plath displaces the focus on the beach to the "vanishing" to whom she is in close proximity. This humanizes the speaker. "Plath does not describe around the death of the vanishing man. Instead she is able to keenly observe every small nuance of the scene in a soft, human and almost loving manner." Seeing Percy Key die gave her first hand experience with death: her father and grandmother's passing were done so at a distance, or, at least, not in her presence. The speaker can then process death more completely, more compassionately. This gives contextual framework to the death and trauma she felt at Berck-Plage. Plath's artistic response seems to transcend human response. "Plath uses alternative artistic routes to interrogate the difficult and traumatic issues she wishes to explore. She allowed her experience of individual death to inform how she could begin to process mass mechancial and anonymous slaughter." Christine Walde's spoke on "'The Black Car' poetry on the Plath/Hughes 1959 trip to Canada." Sylvia Plath's archive - and especially her library - has been a tremendous influence on Walde's interest in Plath and to her own poetry. The many references to Lethe throughout has had a particular resonance. Walde read her own original poetry, as well as her artistic response to Plath's use of Canada and Lethe in "Two Campers in Cloud Country," "Amnesiac," and "Getting There." Chrstine has a series of "Rock Lake" poems, inspired by Plath's "Crossing the Water", which was originally titled "Rock Lake at Night". Walde has a personal connection to Rock Lake, it being a location she has spent time in. This gives authenticity to her poems and a unique position to understand the imagery in Plath's Canada poems and her cross-country trip with Ted Hughes from the summer of 1959. Part of Walde's poetric process includes addressing her creative works to both Plath and Hughes. The poems Walde read where movingly beautiful, a fitting tribute to Plath: and among the most original poems on the subject of Plath (and inspired by Plath) that I have ever heard or read. The discussion of Fever 103 highlights both the biographical and cultural references present in the poem. In an abandoned poem called "Fever" written after the birth of Nicholas Hughes lacked a theme of universal suffering, world annihilation and such that would be present in the later poem, "Fever 103". Very interesting take on an editing decision made by Hughes to the end of the poem. Not him, nor him / nor him nor him" became "not him, nor him / not him, nor him" which disrupts the 3 repetitions of "Nor him" a familiar trope and device in Plath's poetry. Other images in the poem may harken from her 1953 course "The WOrld of Atoms" and a course in Medieval Literature where she read, among others, Chaucer, The Confessions of St. Augustine and Dante, the latter is a particular influence on the poem and is represented quite explicitly. Karen Kukil calls Fever 103 by Sylvia Plath's "Blow torch virgin poem." Fever 103 is filled with "e" sounds just as "Daddy" is filled with "oo" sounds. Brilliant paper and slideshow. If you missed it: you missed it! The "Plath and Hughes" panel was nearly filled to standing room only, which illustrates how important a topic this is, likely to the chagrin of some. Helen Decker spoke on "Sylvia Plath and Ted Hughes Side by Side: What I Can and Can't Tell You", Rai Peterson's paper was supposed to be on "Hughes and the Two Ariel's" but she changed it to "An Effiency, A Great Beauty": Sylvia Plath's Ariel Titles", and Georg Nöffke spoke on "These Super'People: The Superimpostion of Ted Hughes' 'Brasilia' on Sylvia Plath's 'Brasilia'". No one in the room was disappointed. The three presenters in the Walnut Room spoke clearly and expertly on their chosen topics. Decker has been at work on a book about Plath and Hughes for a while, and with any luck we'll see it soon for general consumption. She has been working both on Plath's and Hughes' appearances in periodicals together, as well as the way they wrote on the backs of each others manuscripts and typescripts. In general, and I mean this politely, Decker's presentation was a tease because as much as she could say, she didn't want to go too far. Working extensively with Plath's archives and Hughes', Decker's work looks to put her own spin on a fascinating topic. Rai Peterson's paper sounded interesting in the printed abstract, but when she announced a title change, it suddenly grew more interesting. Rather than discuss the poems Hughes left out of or put into Ariel when it was first published in 1965 (1966 in America), Rai speculated on the ways in which the poetry collection could have been received had they been published under any of the four alternate, deleted titles: The Rival, The Rabbit Catcher, A Birthday Present, and Daddy. She highlighted how the title and title poems might have changed the reception of each work, ultimately agreeing that the poem "Ariel" and the title Ariel was by far the best choice based on the narrative arc of the contents. She interestingly pointed out that of all the changes Hughes and the editors made to the book when first published, that the title was not one of those changes. Georg Nöffke flew all the way from South African to leave me, at least, speechless. I was terrifically excited to hear about "Brasilia" as it is an undervalued and underdiscussed work, both Plath's as well as Hughes's own response. He had a handout of images of the planned city of Brasilia, which completely adds to our understanding of some of the imagery in the poetry. Georg and Lynda K. Bundtzen also discussed at the end some of the finer points of his paper and some of the text in Hughes' poem, which continued to enlighten me on things of which I was otherwise ignorant. I was interested to hear Georg assert that Birthday Letters and the construction of both Hughes' persona in it as well as that of Plath's should be considered in a similar way (intentionally, perpahs?) that we look at Plath's construction of her own personal mythology (as expressed by Judith Kroll in her seminal work Chapters in a Mythology) in Ariel. Georg concluded that in the case of the two poems "Brasilia", Hughes was speaking over Plath, rather than more or less responding or reacting to her, her poetry and their life together. More recap later on the individual talks by Amanda Golden, David Trinidad, and Tracy Brain! The following is a guest post review by Jaime Jost (the Plath Profiles author of "To See What She Saw: The Influence of Sylvia Plath" in Volume 4 and "'Panic' over Puddle Jumping in Plath's 'Mothers'" published TODAY in the Volume 5 Supplement). Jaime was kind enough to review two panels: Panel 1: Plath and Religion; and Panel 5: Plath's Influences: Lowell and Sexton, the Qabalah. Please thank Jaime (and Bridget in the post before) for their wonderful write-ups, for their fresh perspectives on the Symposium panels, and for providing us with possibly otherwise lost impressions due to concurrent nature of the conference structure. Your work, effort, and insight are all highly-valued, very much appreciated, and a valuable contribution to your fellow Plath-heads. Emma Komlos-Hrobsky, editor of Pinhouse Magazine in New York, presented her paper “‘The Black Amnesias of Heaven’: The God-Obsessed Atheist and the Subject of Confession.” She used letters from Plath to Father Michael Carey, who had been at Assumption College in Massachusetts and had been transplanted to England such as Plath herself as part of her research. The correspondence was happening in November 1962 and included Plath’s articulate advisement of Carey’s amateur poetry. She would sign her letters with requests for prayers from Father Carey. Plath wished for God, hoped for God, and thought there may be a God she had not found yet but could possibly find her, help her. One thing Emma said that I found particularly interesting was “If she doubts God, she also doubts her ability to play God,” illustrating Plath’s self-doubt. She also spoke of the limits of language and Plath’s questioning if she could be a master of the language or if the language was mastering her. Emma compares the work of Augustine to Plath’s poetics, stating “Much like the work of Augustine, Plath’s poetry testifies to a conception of the individual’s smallness before a vast and indifferent universe and the ambiguous God that might rule over it” (from her abstract). Katie Rose Keenan, from Cabrini College, Glenolden, PA, presented her paper, “Plath and Sexton’s Mutual Influence.” She writes, “In 1959, Plath met fellow poet Anne Sexton while attending Robert Lowell’s poetry class at Boston University.” The two women had a mutually beneficial and fascinating friendship. In class, Keenan says, Sexton was a “hot mess,” gorgeous, with extravagant jewelry, running late, who sat with her legs crossed. She was a “reckless housewife” whereas Plath presented herself as a serious, businesslike perfectionist. Despite their outward differences, they cultivated an intense literary friendship. Katie mentioned that Plath received in the mail a copy of All My Pretty Ones a week before she started what would become the Ariel poems, which is to say that that influence from 1959 may have been reignited (if it was ever extinguished, that is) and led to that burst of creative explosion. The following is a review of Panel 5: "Plath's Influences: Sexton and Lowell, the Qabalah" and was kindly attended by and written up by Bridget Anna Lowe, author of the Plath Profiles 5 essay "Burning Free: Sylvia Plath's Summer 1962 Bonfires and the Strange Case of the Surviving Christmas Card". I had the pleasure this morning of attending the Sylvia Plath Symposium's Panel #5 on the topic of "Plath's influence on/from other poets." The panel, which was comprised of three speakers, presented their papers in the following order: Sarah-Jane Burton on "Literary Influence and the Boston Trio: Plath, Lowell and Sexton;" KatieRose Keenan on "Plath and Sexton's Mutual Influence;" and, finally, last but certainly not least, Julia Gordon-Bramer on "Plath's Ariel: The Feminine Arrow into the Apocalypse." Speaking first on the panel was Sarah-Jane Burton; in the approximately twenty minutes she was allotted, Burton discussed in some depth the 1959 Boston-trio of poets which consisted of Sylvia Plath, Robert Lowell and Anne Sexton. The three poets came together serendipitously in the spring of that year when Plath and Sexton, then strangers to one another, audited a Boston University poetry course taught by the renowned poet Robert Lowell. As Burton writes in the synopsis of her paper (as provided in the Symposium's Program guide), "Through a discussion of the details of this period  and an analysis of the limited critical attention it has received, [Burton's paper/presentation] aims to illuminate the influential relationships between Lowell, Sexton and Plath, thus reevaluating Plath's writing from the time and presenting a new theoretical lens through which to view all three poets." Lowell was clearly the lynchpin of the trio; it was his poetry course that brought the three poets and personalities together, with special attention paid by Burton to the meeting of, and subsequent mutual influences upon, Sexton and Plath in particular. Without Lowell's course, Plath and Sexton might very well have never met and interacted on the friendly, comradely level they did, despite their having grown up so near each other in Wellesley, MA. Burton's main question she posited was the following: "Would [Plath's and Sexton's] careers have been the same without each other?" To which she answered, definitively, "No." Burton then went on to explain this resolute answer of hers, thereby providing the meat of her following presentation, by detailing and describing the women's influences on one another, especially Sexton's influence on Plath. Burton set up her analysis of the three poets’ respective personalities, lives, and writing styles by describing letters written by Sexton, Lowell, and Plath. This correspondence includes letters written to, and between, one another; i.e. Lowell and Plath wrote to each other about Sexton, and Lowell and Sexton wrote to each other about Plath (but did Sexton and Plath write to each other about Lowell?). She also spoke about the various ways in which the three poets, many years after the poetry class had ended, made public their feelings and impressions about the said poetry class: Sexton wrote a memoir about Plath and her time spent with Plath during class and afterwards at the Ritz; Lowell wrote the introduction to Plath's Ariel; and Plath recorded a revealing interview with the BBC's Peter Orr in which she discussed the respect she had for Lowell and Sexton as anti-gentility influences. Burton elucidated the fact that Plath and Sexton had vastly different life experiences in some respects, while in others their experiences were very similar. For instance, in terms of their differences, Sexton never went to college whereas Plath was a star-pupil who excelled at Smith. Regarding their similarities, Plath and Sexton were both depressives who spent time in mental institutions; the two women even bonded by discussing their own respective suicide attempts over martinis at the Ritz in Boston. Burton said, and n.b. this isn't verbatim, "It was as if the three poets were meant to meet each other. They were all hungry for experience. Plath, like Sexton, was ready for the fire--of writing, of the [poetry] class [taught by Lowell]." KatieRose Keenan was the second speaker at the morning panel; the title of her presentation, as mentioned before, was "Plath and Sexton's Mutual Influence." Keenan's presentation fit ever so neatly and nicely in sequence with Burton's earlier presentation which also included the mutual influence of Plath on Sexton and vice-versa (albeit Burton additionally incorporated Lowell into her triangle-of-poetic-influence). For me, the last sentence of Keenan's synopsis provided in the Symposiums's program guide best sums up the gist of her presentation: "Weeks before the Ariel poems had begun to be written, Sexton had given Plath an advance copy of her second book, All My Pretty Ones (1962). Sexton had already mastered the art of confessional free verse poetry and could have inspired Plath, who was going through hard times, to take off the emotional mask she often presented to the outside world and dive headfirst into her poetry." Keenan began her presentation by introducing herself as someone who has been "mildly obsessed with Plath and Sexton." She said that she is "fascinated by their relationship" but also that they were "so different" from one another. Her obsession with Plath began when she was 12 years old and came across a copy of Ariel in her library; she subsequently kept the library book, never returning it and leaving it delinquent. She brought with her up to the podium this same beat-up, much-loved copy of Ariel. Keenan initially set-up and compared Sexton's poem "My Friend, My Friend" with the similarly arranged poem "Daddy" by Plath. Keening supposed that it was possible that Sexton had brought "My Friend, My Friend" to Lowell's 1959 poetry class (see: above description of Lowell's poetry class included in section on Burton's presentation) to share; "Daddy", as we know, was famously written in October 1962. What was the extent of Plath's debt to Sexton in terms of these two similar poems? This was a question I wish I had asked of Keening during the Q&A period. As well, Keenan discussed the women's differing personalities and appearances, both of which were in stark contrast from one woman to the other. Sexton was, and I quote Keenan's lighthearted comment here, a "hot mess" who dressed well and stylishly, whereas Plath was business-like and dressed herself with a utilitarian sensibility in mind. Keenan said that she had asked herself what "spurned [this] transition" in Plath's work, the "transition" being the change from her earlier, restrained Colossus-poems to her angry Ariel-poems; it was from this question that the thesis of her paper was born. Keenan said that this "transition" has never been discussed at length, and her paper was written in response to this perceived need. In regards to Sexton's influence upon Plath, Keenan put it like this: Plath's early poems (i.e. the poems she wrote before, during, and shortly after the Lowell class) showed "restraint and calculation." It was only after the Lowell class and meeting Sexton, however, when Plath's poetry took a significant change in direction, one building up towards the "unbridled rage" we see in her Ariel poems. It is Keenan's contention that Sexton was at least partly responsible for this drastic transformation in Plath's poetic work, her former "tendency to hide her inner turmoil." Julia Gordon-Bramer was the third and last speaker of the morning's panel. Her presentation, "Plath's 'Ariel': The Feminine Arrow into the Apocalypse," "explores the fifteenth and title poem from Ariel, examining the numerical correlative Tarot card, Temperance, as the poem matched with Temperance's meanings and symbols" (Plath Program Guide, synopsis). The presentation was excerpted from a larger essay entitled "Fixed Stars Govern a Life: The Mystic Reinterpretation of the Work of Sylvia Plath." The poem 'Ariel' is matched directly to the six facets of Qabalah: Hebrew/Tarot correlations; alchemy; mythology; history and the world; astrology and astronomy; and arts and the humanities. [...] This presentation will take the reader line-by-line [through 'Ariel'] to reveal the Hebrew, gematria, and numerological correspondences, as well as an occult initiation rite. Plath wove in details of classical literature such as King Arthur and The Little Mermaid, and Irish Medieval, Celtic, Norse, and Babylonian myth in celebration of female power and fire. [...] Perhaps what is most impressive however is the juxtaposition of the real-life history of the World War II bombings of Hiroshima and Nagasaki, and the sideline tales of American fighter pilots and female foreign correspondents. [...] Most have understood the poem 'Ariel' to be about a wild ride on a runaway horse. And that might still be true, as one small and less-significant meaning. 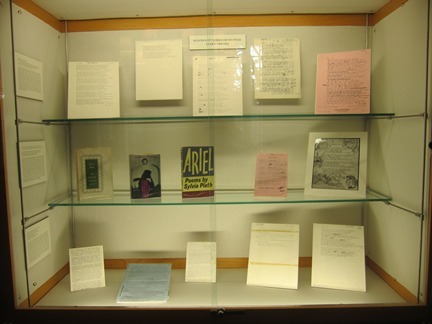 We have always known that 'Ariel' is one of Plath's greatest poems. Now, it is time to understand why. I was most impressed with the way certain parts and lines from 'Ariel' corresponded so closely with certain aspects of World War II and the nuclear bombing of Hiroshima and Nagasaki. For instance, the incomplete-phrase "And now I" from 'Ariel' may signify the red "eye" ("I") (or circle) on the flag of Japan. Also relating to red "eye" ("I")s, besides the red circle on the flag, are the red eyes of those people who survived radiation from the bombs--the radiation turned their eyes red. I asked Gordon-Bramer at the Q&A section of the panel, again naiively, if she meant to say that Plath had written 'Ariel' with an eye (“I”?) towards consciously relating the poem to the Tarot and Qabalah etc, or was it just pure coincidence? Gordon-Bramer's response? "Both. The link is both divine and conscious." As I write this review of the morning’s panel, it is late and it has been a long day; I am sure I have not done justice to these three women’s presentations: each was excellent, insightful, and intelligent. Just lovely. Thank you Sarah-Jane, KatieRose, and Julia. Today was breakneck: nonstop: ceaseless: endless: a great day to be a Sylvia Plath reader. I highly anticipate giving a round-up of the day from my own perspective, and hope that some of the kind scholars who expressed interest in reviewing the panels that I could not sit in on have reports to me before too long about their impressions, too. I think it is important to present more than my voice and opinion in this; so if you're reading this and you were in the same panel I was: please consider writing something up from your own point of view. Please. This morning the literary panels began at 8:30. Or, circa 8:30. Certainly an early start time but the people that came to hear the darling Jess McCort (and author of "Sleeping Beauty Awake: Sylvia Plath through the Looking-Glass" and "Alice in Cambridge: Sylvia Plath, Little Girls Lost, and “Stone Boy with Dolphin”") and myself discuss The Bell Jar were certainly wide awake and seemed to be eager listeners. I expect a summary review of this panel by a willing participant in the next days and will post it online as soon as I get it! But, I'll say briefly about the panel that Jess' title was "'This Smith Cinderella': Breaking the Glass Coffin in The Bell Jar and my paper was titled "Sylvia Plath: Palimsesptic Writer". After this panel, for which there were three concurrent panels, listeners were treated to Janet Badia, author of the fascinating and recent Sylvia Plath and the Mythology of Women Readers discuss "The Other Anniversary: Plath's Dent to Ms. Magazine's ." In her paper, Badia points out that in addition to this being the 50th Anniversary of the October poems, it is also the 40th anniversary of Ms. Magazine; and from its first issue, how the magazine made a significant contribution to Plath's fame. In its first issue, Ms. Magazine printed Plath poem for three voices "Three Women" in which Plath traces the purely female experiences of childbirth and miscarriage. She talked about the issues first cover of a many armed figure with domesticated symbols in each hand: it actually reminded me of the fig tree imagery that plagues Esther Greenwood in The Bell Jar. What was particular fascinating was Badia bring up the reconsideration of Plath that the magazine published some months later in a long essay by Harriet Rosenstein. After this, I was up again for a paper called "Sincerely Yours: Sylvia Plath and The New Yorker". In this paper, I spoke about Plath's business correspondence with the magazine, and was able to do something in the talk that I was not able to do in my paper this summer, "These Ghostly Archives 4: Looking for New England" with Gail Crowther, which is quote from the letters. Someone may have intentions to review this talk? So for the meantime I will not go on any further on this. I was really delighted to read it, and felt that the information presented was largely new and interesting. But, I might be delusional. The morning sessions concluded with more literary panels. Again, I do expect a synopsis of one or two of them. The panel I attended dealt with "Plath and Female Embodiment / Body and Suffering". 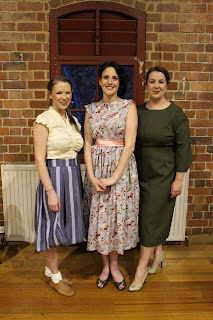 The three panels were, in order of speaking, Colleen Abel, Lauren Benard, and Clare Emily Clifford. Abel's "'Inhabited by a cry': Interior and Exterior Landscape in the Late Poems of Sylvia Plath" approached Plath's poems as reflecting some of the emotional traumas she underwent, and that as a result her poetry changed dramatically. Citing the more imagistic poetry such as "The Colossus" and "Watercolor of Grantchester Meadows", Abel went on to argue that there developed a "psychic fushion" between the physical and emotional landscaped. A rare early example of this was "The Eye-Mote", but Plath more notably fuses the self and the world in the later poems such as "Poppies in October" and "Tulips". Abel used some of the theories (or at least a theory) of DW Winnicott, particularly his theories of the transitional object. Lauren Benard's paper "A Choreography of Female Wounds: Embodied Aesthetics in Sylvia Plath's 'The Detective', Fever 103', and 'Cut'" discussed the fear and fascination with which Plath regarded the functions of the domesticated female body. I was particularly interested to hear this paper as "The Detective" is one of my favorite poems by Plath: but the approach by which Benard examined the poem was completely new to me. The poem has now been opened up to me in a completely new way and I am thankful for this. I was interested in her comment, citing Nancy Hunter-Steiner, that Plath was somewhat addicted to experience, and that in this addiction, she sought the kind of experience that she could somehow use creatively. The treatment which Benard, who has published with Plath Profiles ("Taking on a Mourning Her Mother Never Bothered With: Esther's Anguished Memory and Her Resistance to a Domestic Life in Sylvia Plath's The Bell Jar, gave to the three poems was expert and well supported, her argument clear and fulfilled. Clifford, another Plath Profiles author (I Have a Self to Recover: Sylvia Plath and the Literary Success of the Failed Suicide), has a penchant for the gruesome, as was evident in her paper "'A Case Without A Body': Body Parts, Dead Bodies, and the Poetic Corpus in Plath's October Poems." Clifford terms the poems she looked at as "postmortem poems" and fuses elegy with an increasing market (and stomach for) the medicalization of death, the funeral industry, war, and genocide through the lens of forensics. She cited the rise in television of programs which feature cadavers and other icky, fairly explicit examples of death. But Plath was working with death and body parts - as have a lot of writers - well before this became appropriate for network television. Clifford largely looks at the death and dismemberment that exists in Plath poems in a way that is non-traditional from the generally accepted rebirth motif. Indeed, she looks at the poetic self and corpus in its inbetween stage: after death but before the rebirth. There were some stellar readings in the afternoon by Amanda Golden, David Trinidad, and Tracy Brain - as well as a final panel section: but these will have to wait a bit as Sylvia Plath Info needs his beauty sleep (shocking, I know: but this isn't nature). Lynda K Bundtzen began the day discussing Sylvia Plath’s psychotherapy, use of unconscious in 1958 poems. Making use of Plath's therapy notes with Dr. Ruth Beuscher, Lynda referred at times to Sigmund Freud's "Mourning and Meloncholia", Lacan, and Letters Home, and looking applicably at several poems by Sylvia Plath, among them "The Beekeeper's Daughter," "Man in Black," "Electra on Azalea Path," "The Colossus," "Daddy," and "Purdah." Langdon Hammer spoke on James Merrill’s use of Ouija Board for poetry inspiration. Hammer has been at work on a biography of Merrill for a decade which is most definitely a labor of love. It promises to be thorough and excellent, judging from the essays of his that I have read and the presentations through which I have sat. This was not a paper on Sylvia Plath, but Hammer did refer to Plath's practice of Ouijaing with Ted Hughes. Between this and the 1 o'clock panel with poets talking about Plath influenced their poetic process...I went to the Lilly Library to continue feeding my archival fever. I feel badly for missing Linda Adele Goodine and Suzie Hanna's talk on juvenile/adult fantasy, liminal space between waking and dreaming in visual art and film; but I am hopeful that some kind person has taken notes and will considering typing up a review which can be posted here on this blog, or, on a blog of their own. The poets discussing Plath's influence on their poetic process was quite interesting. A couple of them found and defined Plath to be a confessional poet, which is really at odds with the way she is classified by scholars, critics and academics. In some ways, technology and Starbucks notwithstanding, we might have been in 1975 rather than 2012! Each of the poets caught something off of Plath's poetry (and life) that spurned them into their vocation. A quite wonderful panel with deeply sincere memories of the importance of Plath in their lives: both that initial spark and how Plath continues to be a presence in their poems. The discussion on Plath Profiles and Plath on the web was not as good as it could have been because Bill Buckley, the founder of Plath Profiles, was unable to attend at the last moment. This unfortunately left me on the stage alone and I can only offer my condolences to the brave people that sat through it! I did read some prepared remarks by Bill about his desire to create a journal dedicated to Plath and its founding at the 2007 Plath Symposium at Oxford. After this it was back briefly to the Lilly Library to look at a few more things to close out the day. My call for people to meet at 5:30 (see post yesterday) was met by one or two brave souls. Thank you: you know who you are. With any luck, somehow, all the panels will have summaries written about them but at least there will be a good few writes ups to which we can look forward to reading. Notes on Catherine Bowman and David Trinidad, Suzie Hannah and Tom Simmons panel on archival-based poetic and research process, animated film and sound design, 24 October 2012, 1:30-2:50 Poetic based research, animated film, and sound design. 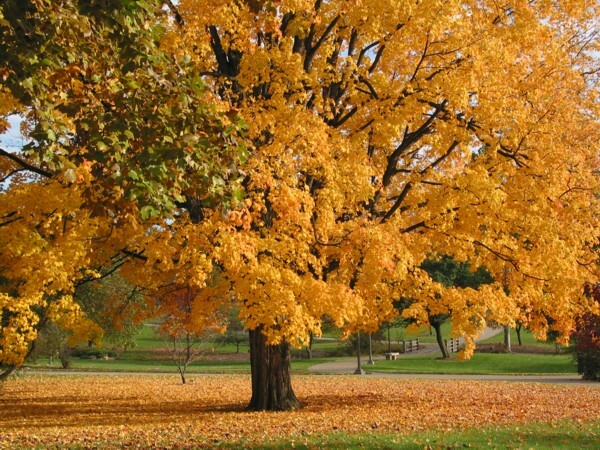 What makes us Plathofiles? Is it a line? Is it a book (eg reading The Bell Jar, or a teacher? 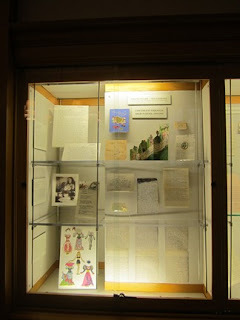 What happens when you are lucky enough to be in the Lilly Library with Sylvia Plath's works, boxes, things, and to examine the dresses she made as a child in the 1940s, the paper dolls, the ephemera, her paintings? What is text? Is it the poem? No, not at all. These people cry, it is this, and this, look and listen, see. All four of the presenters in this panel showed is how with colour and sound, what influenced Plath in creating her poetry. As someone fascinated by Sylvia Plath's work and life for more than 30 years, I found the works, separate from the archive, but clearly related to the poetry, more interesting. The work, colours and art related to Plath's archive was fascinating. Was she a poet, a painter, a great cook? There was a debate on these questions and aspect of Plathafter the presenter's conversation that was fascinating. Are you going to the literary panels at the Sylvia Plath 2012 Symposium? On 11 October I requested that people attending consider taking notes during the panels sessions and writing up mini reviews to appear on this blog. Happily, I got two such takers immediately. But there are far more panels going on simultaneously for the three of us to faithfully report to this blogs readers. So, the panel presentations pages is located here. 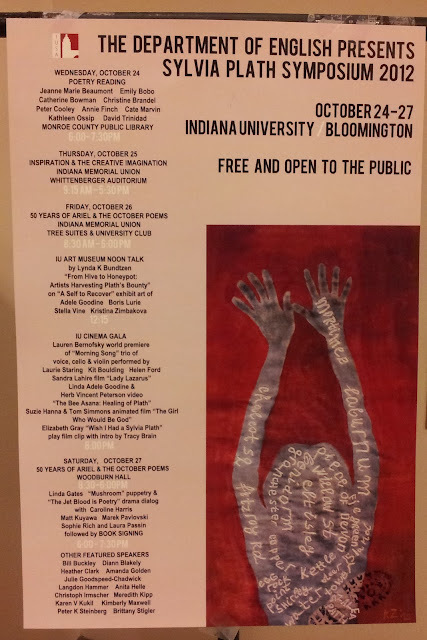 What I'm proposing is that anyone interested in participating in this to please look for me Thursday, 25 October 2012, at 5:30 PM in the IMU Whittenberger Auditorium. Then, we can discuss what interests us and assign panels and papers to review. It shouldn't take too long, & so maybe we can go grab a drink & some food afterwards in town? Talk Plath? I didn't say this before, but the reviews should be to me as soon as possible after the presentation is given: ideally the same day. Full credit to you will naturally be given, unless you tell me otherwise that you would like it to be anonymous. Today was a continuation of research into Sylvia Plath's pocket book calendars in the Lilly Library. I had to double-back to finish the 1954-1955 calendar and I am still in amazement at the level of recorded detail that is available. The other day I commented about how a visit to the archives to read through everything could mean never having to read a biography of Plath and I think I still stand by that: though obviously the biographer's narrative lends a particular color to her life's story. Which can be interesting; like in a similar fashion to criticism: it's far more interesting to read the original writing than criticism about that writing. Though often it is interesting to see how the critics make connections and bring out hidden elements. I spent a brief time re-looking at the Plath Mss materials that were acquired in 1961 as I needed to do some follow-up things. But I think the real focus of the day was the start of the Sylvia Plath 2012 Symposium. Today's events were all about the archives: teaching with them, introducing students to primary source work, and it was really fascinating to see that (primarily undergraduate) students are working with Plath's papers and making significant and really interesting discoveries. The first talk was Karen Kukil on teaching and learning with Smith College archives; this was followed by IU professor Christoph Irmscher and his teaching with Lilly archives. Two students, Meredith Kipp and Brittany Stigler, spoke very eloquently on what it was like as freshmen to study Plath, Plath’s teaching texts, techniques, and book marginalia. I wish I had had this kind of opportunity when I was an undergrad, even though I'm not even certain my college had a special collections department or anything like that. It's absolutely fascinating. I was honored to have lunch with Karen Kukil, Tracy Brain, and Lynda K. Bundzten. This went a little over, and so I did not attend the panel on archival-based poetic and research process, animated film and sound design. Which is a shame as I wanted to hear David Trinidad speak very much; I do not feel comfortable walking into things late, feeling it is disruptive. I have since learned that the panel started late, itself. Drat. So, in the meantime I came back to the archive and then went over to the IU Art Museum to see the exhibition art of Linda Adele Goodine, Boris Lurie, Stella Vine and Kristina Zimbakova. The two Zimbakova pieces I cannot speak highly enough of; the Vine I can't speak lowly enough of. Goodine's were quite provocative and I completely missed the Lurie. After this I sat in on the archive show and tell, which included a brief history of both the Lilly Library and Plath's affiliation with it (as in how the materials came from each of the accessions). The materials on display included, but are not limited to: two self-portraits from the 1950s (I think); two locks of her hair (one massive, the other a little smaller) (Plath's hair, considered a "fetish object" are among the most popular items requested in the archive), and then a lot of materials to do with her October 1961 poem "The Babysitters". 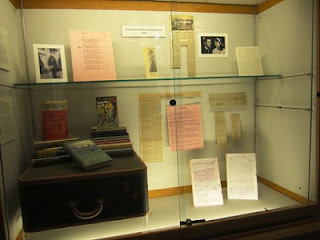 These include the working drafts of the poem, as well as contextually relevant materials such as her calendar from 1951; photographs from summer 1951, letters. There were other items that would not fit on the table, such as a college art scrapbook with collages, and recently acquired juvenilia (which I saw in January 2010). This morning I continued looking at Sylvia Plath's calendars in Plath mss II, Box 7, Folder 6. The calendar was October 1955 - early October 1956: or, her first year as a Fulbright Scholar at Newnham College, Cambridge University. The majority of the morning was spent comparing undated letters to a former boyfriend, J Mallory Wober, to the minute details Plath recorded in her calendar. 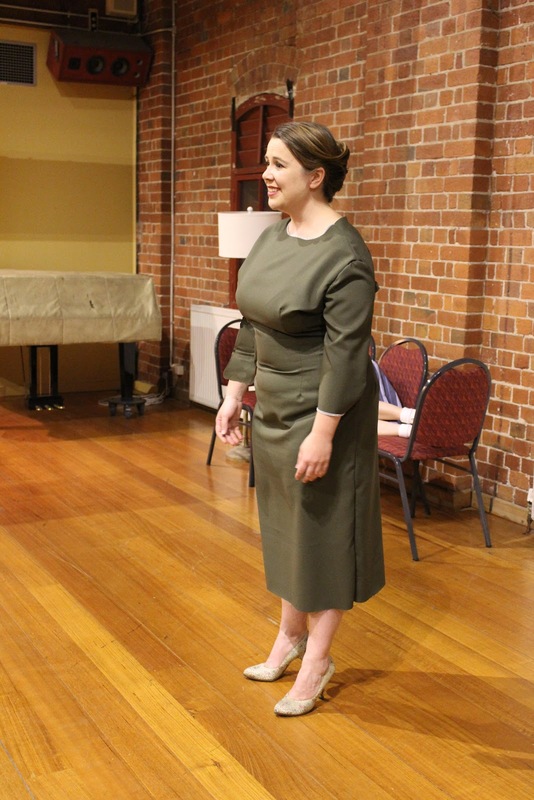 The structure of her days at Newnhan are meticulously recorded down the hour, including lectures, ADC rehearsals, meetings for tea and sherry, dates, letters written, papers due, food consumed, physical ailments: basically an encyclopedia of autobiography. Mostly likely caught up in the passion of the archive I will say that there is no need to read a biography of Sylvia Plath when one could simply come here (simply is most definitely not the right word since I believe this is one of the harder archives to get to - but it could be worse, no offense Wyoming: but it could be in Wyoming) and spent a week reading Plath's life written by Plath. Between the calendars here, the letters to her family and others, if one was truly interested in Plath's formative years through her early 20s one would really only need come here. And come here you should because the Lilly Library is just awesome. After I got the the point where I was satisfied with my dating of the letters to Wober, I carried on studying the days of Sylvia Plath's life. Through the tumultuous end of her relationship to Richard Sassoon and the darkness that was late January and early February 1956 - to the miraculous meeting with Hughes and the passion of their new love and life together - the agony of being separated, the decision to marry and their Spanish honeymoon - late August and September in Yorkshire, and the return to Cambridge. There is another calendar for October 1956 - September 1957, and it largely filled in faithfully through November when she and Hughes took up residence together at 55 Eltisely Avenue. But after that as the rigors of her academic pursuits mounted there was far less information captured. Which is understandable but also a disappointment. And by the time I got to the last page it was time to depart for the day. I learned more about Sylvia Plath's life in these two days than I thought possible. I learned so much that I do not know how to even begin disseminating the information to you: the greedy readers. I wish there was a way but I can certainly safely say the much - if not all of what I did learn - will be made know in the work I do. Through papers like the "These Ghostly Archives" series with the estimable Gail Crowther and papers I do on my own. Happily there are some significant improvements to two of my presentations (on Sylvia Plath's correspondence with The New Yorker magazine and "Sylvia Plath: Palimpsestic Writer" on imagery in the poems and The Bell Jar) are possible from the materials I have used the last two days. Conducting research alongside Amanda Golden, Christine Walde and David Trinidad (at all at the same table) and Julia Gordon-Bramer and Tracy Brain at the table next to us has proven to be simply wonderous. There is such a friendly and collegial atmosphere. Tomorrow starts the Sylvia Plath Symposium so it'll sadly mean less archives time, but more being among peers, meeting new wonderful people and listening to fascinating papers. Updates throughout via the blog and Twitter! What a start to the week. The week of all Sylvia Plath all the time, though saying it like that makes it just like any other week. I met the poet and Plath essayist David Trinidad Sunday evening in Bloomington where we immediately got our Plath on: what a fun, great man and we had some stellar discussions. Today in the Plath archive at the Lilly Library we worked across from one another, like dueling pianists. He was primarily reading Plath's letters, and being less focused, I was all over the place. I began with the Plath mss papers - the ones Plath sold in London to a bookseller who was acquring poets papers for the Lilly Library. These are largely poems written in 1960 and 1961, but mixed in are the odd pages of The Bell Jar and short story ("The Fifteen Dollar Eagle"). Not a lot of beefy drafts the way that her later poems are (the ones held at Smith College). However there are fuller files folders for poems such as "Wuthering Heights", "The Surgeon at 2 A.M." and "Private Ground", to name a few. I was fascinated to work with these poems. Many were written on versos of a draft manuscript of her book The Colossus. Some contain writings by Ted Hughes. So much attention has been focused on the Ariel period poems that I feel these are somewhat ignored. That being said, it also is not hard to really see why because Plath neither saved nor numbered nor dated her earlier poems the way she did those from 1962. It would be safe, I think, to say that the reason why she did become meticulous about it is because she had successfull sold this "scrap paper". After I worked with this, I switched to the Lameyer mss because in a previous trip I had made some transcriptions from the letters held in this collection and wanted to check my work. I also cannot get enough of the mostly color photographs of Plath from 1954-1956, from Smith College to Venice, Italy. During the course of the morning both Amanda Golden and Julia Gordon-Bramer came play in the archives and it was most awesome to see Amanda again, and terrific to finally meet Julia. Following this, I called Plath's Cambridge University period notes in Box 13 of Plath mss II looking for a needle in the haystack: and sadly not finding it. I saw something in 2010 when I was here on the Helm Fellowship, and was trying to find it again only to discover I had no real recollection of where it was I saw this document. Very frustrating. Maybe tomorrow, maybe Wednesday or so I'll have a more positive update on this front. The afternoon I spent looking through Plath's calendar's for 1952-1955 (Plath mss II, Box 7) as many of her letters to Gordon Lameyer are undated (and without the envelopes for post-mark identification/assistance) so I was looking through her academic and summer doings in the attempt to accurately date these undated letters. I am pleased to say I think I nailed 100% of those questionable epistles down. By the time I finished, because it wasn't all hunting and gathering: there was quite a bit of loitering over the details of her days, it was time to leave for the day. Always a downer. The good news: Tomorrow should bring The Plath Diaries to the library. And, speaking of which, the library re-opens in just 11 and a half hours. A Piece of Plathery has reviewed a recent performance of "Three Women" by Sylvia Plath, directed by Melanie Thomas and produced by Caged Bird Productions. In addition to Plathery's review, if you missed them, you can see photos from rehearsals in two previous posts: this one and that one. The following books will be for sale at the Sylvia Plath 2012 Symposium and many - if not all - of the authors will be on hand Saturday 27 October at 7:30 PM to sign. There may be additional books available, too. I received the following information recently from Mark Ostas regarding a one day event will commemorate the 80th Anniversary of Plath's birthday and the 14th Anniversary of Hughes' death. It sounds like a really interesting conference. Among their guest speakers is Plath's contemporary and author of Bitter Fame Anne Stevenson. The conference will take place in the city of Katowice, Southern Poland - the seat of the Silesian University as well as the Silesian Library which is the venue of the conference. The conference is the part of the series of events marking the 90 years of the Library, although its present building is as modern as some of the poems by Sylvia Plath and Ted Hughes. 'Bitter fame' – a session on the 80th anniversary of Sylvia Plath's birthday and the 14th anniversary of Ted Hughes’s death. 12.30-13.00 Prof. Anne Stevenson "Ted Hughes and Sylvia Plath in the XXIst century." 13.00-13.30 Dr Tara Bergin "The Sound of Translation: The influence of translated poetry on the Ted Hughes' Crow." 14.00-14.30 Dr Gabriela Marszołek "Nature in the poetry of Sylvia Plath and Ted Hughes." 14.30-15.00 Prof. Zbigniew Białas "The Prospero's Daughter." 15.00-15.30 Poetry and existence – Dr Maria Korusiewicz in conversation with Dr Paweł Jędrzejko. 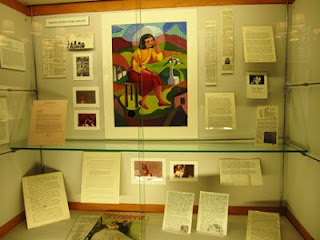 The panels for the Sylvia Plath 2012 have been updated. Please revisit the panel presentations page to see the latest line-up. Although there is a recently discovered erroneous omission, I have been told the panel presentation page is final. 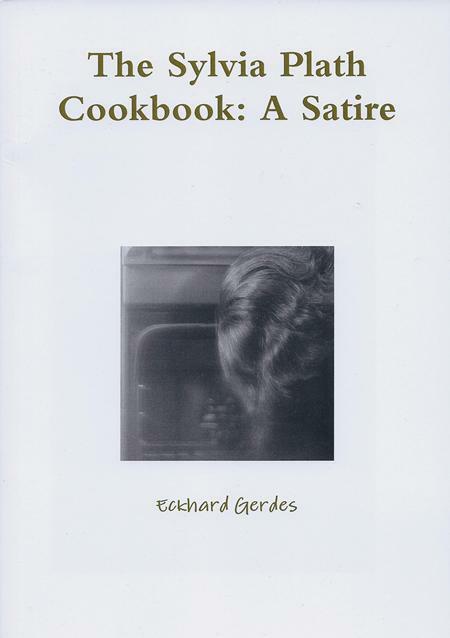 Eckhard Gerdes has recently had published his The Sylvia Plath Cookbook: A Satire. From lulu.com, "The second in Sugar Glider Press' series of smaller works, Eckhard Gerdes' The Sylvia Plath Cookbook: A Satire is the clever story of a writer toying with the idea of putting together a piece on the tragic poet. As his obsession seems on the verge of permanently distracting him, it is Sylvia herself who emerges from her doom to set him free." You can purchase Gerdes slim satire from the publisher or Amazon. There are several clever allusions to Sylvia Plath's works, which does suggest a familiarity with the subject. As well, there are some seemingly obligatory references to the manner in which she died, which is always a slippery slope. Calling the book a satire might excuse this kind of thing, but I find it borders on crass exploitation and quasi-insensitivity. The Lilly Library is a great place to conduct research. 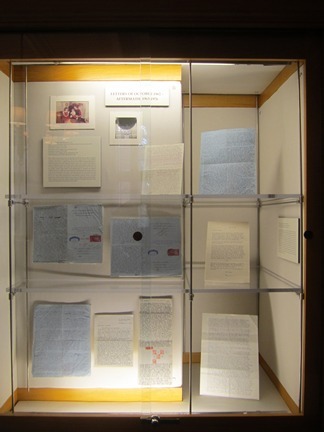 Many Sylvia Plath scholars will descend upon the library's reading room over the next two weeks. For some, it will be their first time working with Plath's manuscripts, for others it will be a long-overdue return to a great place. I have had the pleasure of conducting Plathian research in more than a dozen repositories and although they are all libraries: they each have different policies and procedures for handling the materials. 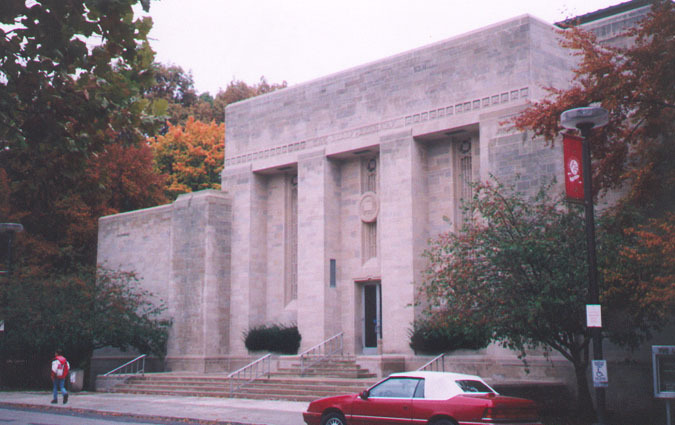 The Lilly Library is a lot like Fort Knox: they are strict. But they have to be. 1. You'll only be allowed to work with one folder in one box at a time. 2. Ensure that the folder and all the papers with the folder remain fully on the desk at all times. Do not let anything hang over the edge. You will be reprimanded. 3. Keep the papers in the folders that you work with in the order in which you find them. If something's not right, consult with someone on staff. 4. Because of the "Transitions" exhibit in the Lilly Library, something like 70 items will not be available for scruntiny in the reading room. You'll have to visit the exhibition space to see them. 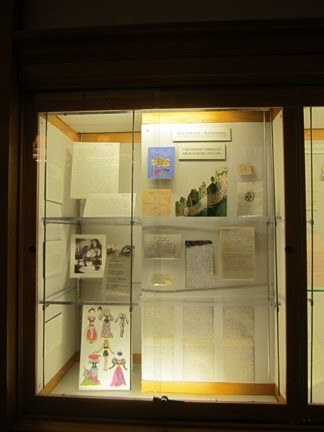 These include some of her diaries, books from her personal library and poetry drafts, as well as items such as her extravagant childhood paper dolls, suitcase and unpublished letters from husband Ted Hughes. 5. Photography of materials is limited. Some libraries allow for rampant, free photography of their collections; however, each library is, as I have said, different. Consult with a librarian/archivist to determine what can and cannot be photographed. 6. Transcribe until your fingers blister. 7. It might be chilly in there so bring a sweater. Remember: archives are not about human comfort. They are about making the paper and other holdings last. Of course, I'm certain there are more things to keep in mind, but these are what I can think of right now! If you are going to be conducting research before or after the Symposium, I hope you enjoy yourself. If you do not have a blog or some other outlet in which to talk about the experience, please consider this blog as a welcome space to write about your time. 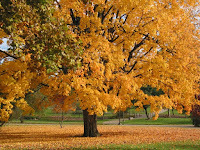 I'd love to have guest posts and am sure the blogs readers would love to read your impressions. I think the most important thing to remember is that it is a privilege to work with Plath's papers (or really, any collection within an archive). Enjoy the archive. Respect it. I hope that at any given moment I am not working with something that another researcher is keen to have access to. If you think I might be, just let me know and I'll request something else. As for my own research plans, in the past I have blogged nightly about my experiences in the archive. See the posts from my January 2012 trip to Smith College and from my January 2010 trip to the Lilly Library. I hope I don't repeat myself in my forthcoming updates (next week! ), but I do find that by re-examining certainly materials, new information can be learned because of shifting perspectives. I have a couple of things I need to look at from Plath mss (the materials they bought during Plath's lifetime!) for one of my papers; but the most effort will likely be spent in Plath mss II, which is undoubtedly the largest focus for many people. In two weeks the Symposium will be under way! 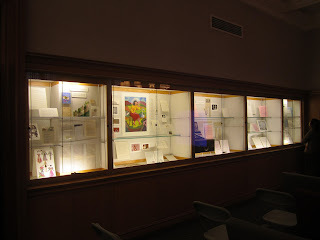 The panel presentations for the Sylvia Plath 2012 Symposium are now online and presumed final. The main Symposium website - for all your informational needs - is here. Please review the panel schedule and the main program schedule! Why? Because I'm asking for fellow attendees to help in reporting on panels and other events for the benefit of those that cannot attend. What I would like to do is schedule a time to meet in the IMU Conference Center on the evening of Thursday 25 October to "assign" people to write reports. So, please think about this: is this something you'd like to do? To write notes and impressions on what you are hearing? Check the blog the week of the Symposium to find out when and where we'll meet to go over panels. Please also email me peterksteinberg at hotmail dot com if you are interested, as well. First come, first served. 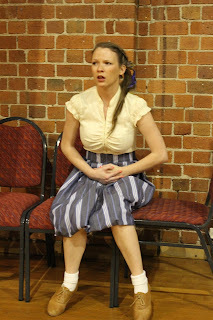 Director Melanie Thomas has sent over four additional photographs from her production of "Three Women" by Sylvia Plath. Enjoy! And if you make it to a performance please let us know. "A hot blue day had budded into something." "The sun is down. I die. I make a death"
"Their footsoles are untouched. They are walkers of air." "I shall meditate upon normality. I shall meditate upon my little son." 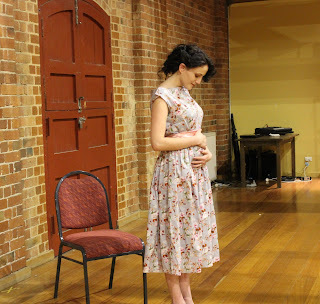 Director Melanie Thomas of Caged Bird Productions has been kind to share with us some photographs from the rehearsal of "Three Women" by Sylvia Plath, which opens tomorrow, 9 October, for a limited engagement at The Owl and the Pussycat, 34 Swan St Richmond VIC 3121, in Melbourne, Australia. Third Woman (lying down) and Gabrielle Savrone as the First Woman. 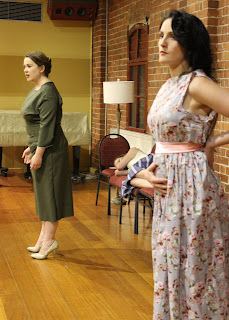 "Three Women" by Sylvia Plath stars Gabrielle Savrone as First Woman; Narda Shanley as Second Woman, and Carly Grayson as Third Woman. "Three Women" is directed by Melanie Thomas, Produced by Jessica Morris Payne, and presented by Caged Bird Productions. Recently I had cause to revisit Eye Rhymes: Sylvia Plath's Art of the Visual edited by Kathleen Connors and Sally Bayley (2007, OUP, sadly out of print). It is absolutely an essential book for Plath's readers. The illustrations alone are worth it to own. In Kathleen's wonderful book-length essay "Living Color: The Interactive Arts of Sylvia Plath" there is a reference to a book, An Ear for Uncle Emil by E. R. Gaggin, Plath read that wasn't - but now is - listed in her library on LibraryThing. 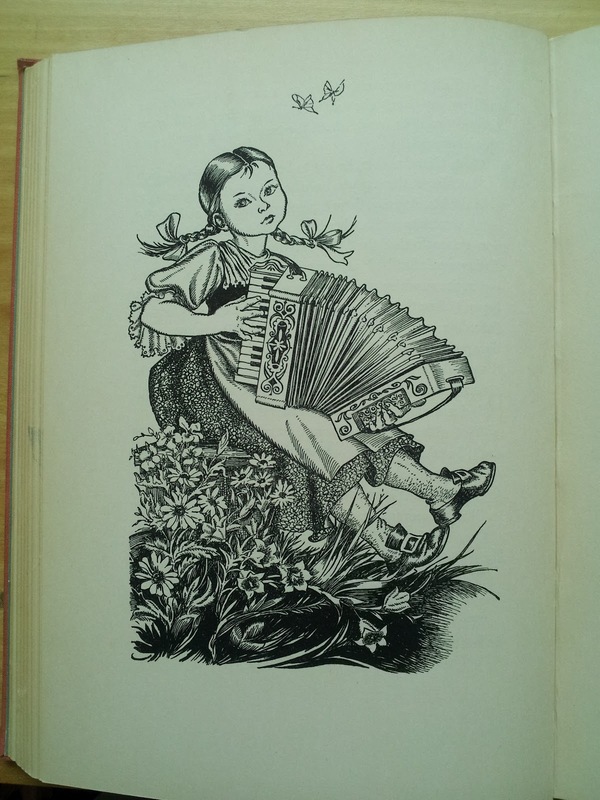 Plath presumably read this book circa 1944 and was inspired to copy one of the many illustrations drawn by Kate Seredy in the book, which was first published in 1939. Plath of course learned some of her drawing skills by copying, and it is analogous to suggest she learned to write poetry in the same way: by copying. Of course there were innate skills that she brought to each art form: I'm not suggesting otherwise. In considering the drawing reproduced in Eye Rhymes, on page 12, I thought: would it not be interesting to see what the original looked like? Fortunately a local college library holds the book so I went over there yesterday to find the source. Below is the original, and beneath, courtesy of Google Books, Plath's drawing. Today, reading Plath's diary, I learned that this drawing was completed on Wednesday, 19 July 1944. 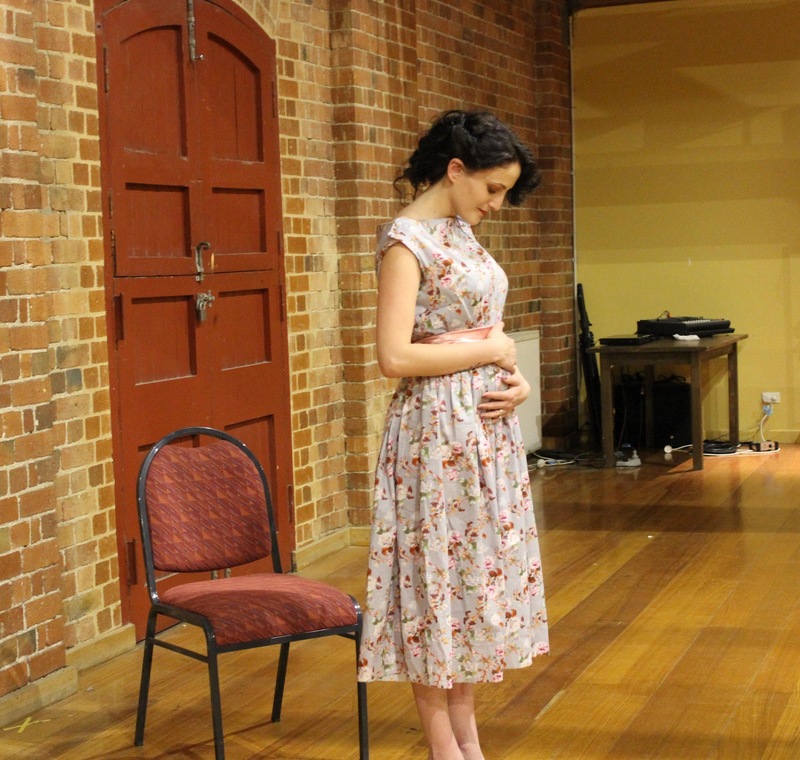 Sylvia Plath's "Three Women" will be performed on stage in Melbourne, Australia from 9 to 14 October 2012. I am a great event. I undo her fingers like bandages: I go. "Highly intricate and with an uncompromising, confessional style, Sylvia Plath's "Three Women" is a decidedly multifaceted poem based on three very distinct experiences of pregnancy: becoming a first-time mother, trying to survive yet another loss of a child and the difficult choices of giving a child up for adoption. "With special permission by the Estate of Sylvia Plath and Faber and Faber Ltd, Caged Birds Productions brings to stage Plath's only script, written one year before her untimely demise, whose delicately layered voices question existence, the ache of belonging and delve into shrouded emotional experiences of childbirth." Below is information you need to know from the official media release! Acclaimed poet Sylvia Plath, in her only script, delicately interweaves three uncompromisingly honest experiences of childbirth, miscarriage and adoption, expressing thoughts on pregnancy which, 50 years since written, remain universal yet rarely spoken. 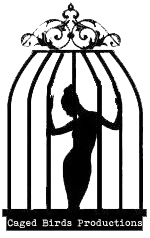 Marking the first time her estate and publishers have granted rights for an Australian performance, Caged Birds Productions presents Plath's "Three Women" at The Owl and the Pussycat, Richmond, during this year's Melbourne Fringe. 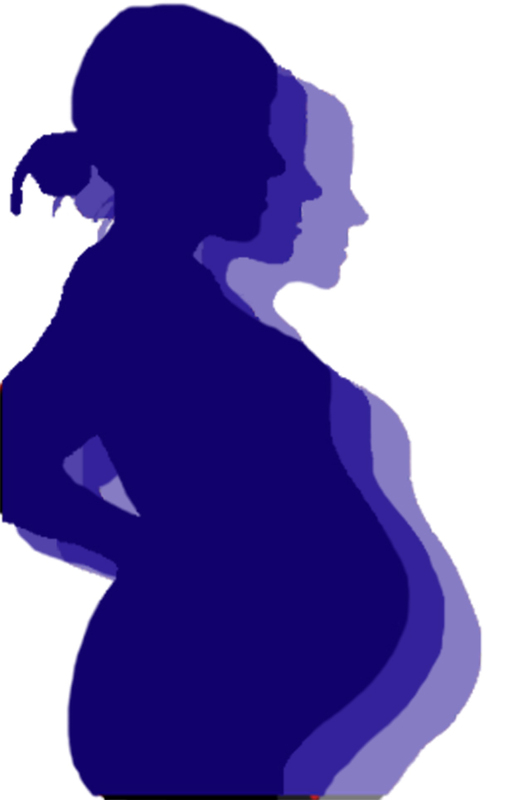 "Three Women" echoes Plath's own experiences of pregnancy: the birth of a daughter then son in 1960 and 1962 and a miscarriage in 1961. Within 6 months of "Three Women" being broadcast on BBC Radio in 1962, Plath committed suicide aged 30, with gas from the oven in her London home, her children left with milk and sealed off in an adjoining room. Despite being Plath's only script, with each character capturing Plath’s confessional and highly empathetic voice; "Three Women" remains a little-known work. Since first staged by the Royal Shakespeare Company in London in 1973, "Three Women" has been performed only several times in the UK and US. On discovering the script, director Melanie Thomas immediately felt it resonated with her personal experiences of pregnancy and vocalised thoughts that, though many share them, are often left shrouded and left undiscussed. 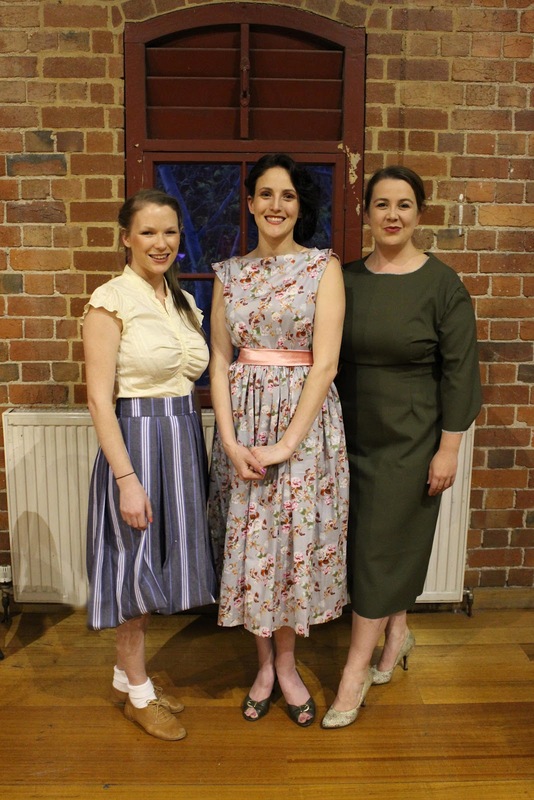 Determined to therefore bring "Three Women" to stage, this is the first known authorised production of the work in Australia. "Three Women" (c) Estate of Sylvia Plath and reprinted by permission of Faber and Faber Ltd.